avast! Free Antivirus 5.0 final has been officially released by ALWIL, and avast! Internet Security, avast! Antivirus Pro together with avast! Free Antivirus have been upgraded to version 5.0. The version 5.0 of avast! security products is designed to have low memory footprint or consumption when running in foreground or background, has redesigned user interface (UI), improves heuristic protective detection, and adds detection of potentially unwanted programs (PUPS). Continuous protection against viruses and spyware. Ensures all mails sent and received are clean. Keeps the users protected from “chat” infections. Stops attacks from hijacked websites. Includes antivirus and anti-spyware engine. File system and mail shield. 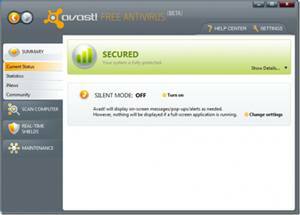 The Avast Free antivirus works well in Windows platform including Windows XP, Windows Vista and Windows 7. The Avast Antivirus 5.0 is available at the , or user can use the following direct download links to grab the setup installer immediately.